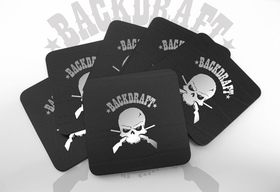 Protect your medieval or brand new table with these awesome Backdraft coasters. Works fine for beer, whiskey, drink or any other glasses! Handmade coasters in real leather! The price is for 6 coasters!